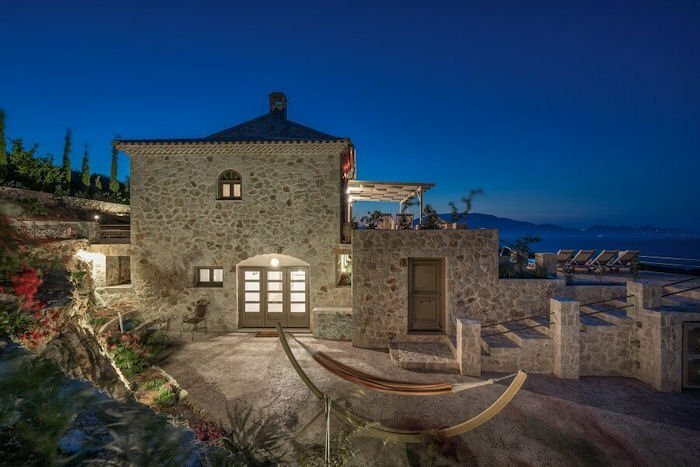 Villa Tourkouaz Exi with four bedrooms is a very accommodating villa, and features its own private pool with hydro-massage, and an exclusive indoor steam room. Villa Tourkouaz Exi with four bedrooms is a very accommodating villa, and features its own private pool with hydro-massage, and an exclusive indoor steam room. It also has direct access to the sea. The villa offers both indoor and outdoor dining. The sitting-dining room with fully glazed outlook facing the pool area. A dining table outdoor under the covered veranda with breath-taking views of Kefalonia and the wonderful surroundings. On the ground floor of the villa is an ensuite master bedroom and an ensuite twin bedroom. On the lower floor there is a double bedroom and a quadruple room, which both share one full bathroom.